Bitter pit reduces the fresh market quality of fruit. It was first described in Germany and is recognized as an abiotic disorder found in all areas of the world where apples are grown. This physiological disorder is influenced by climate and orchard cultural practices. Small brown lesions of 2-10 mm in diameter (depending on the cultivar) develop in the flesh of the fruit. The tissue below the skin becomes dark and corky. At harvest or after a period of cold storage the skin develops depressed spots on the surface. These most often start to appear as water soaked spots on the skin near the calyx. These spots generally turn darker and become more sunken than the surrounding skin and are fully developed after one to two months in storage. Fruit located on vigorous, leafy, upright growing branches have a greater potential to develop bitter pit than does fruit that develops from spurs or on horizontal wood near the tree's main frame. Young trees that are just coming into bearing are the most susceptible. 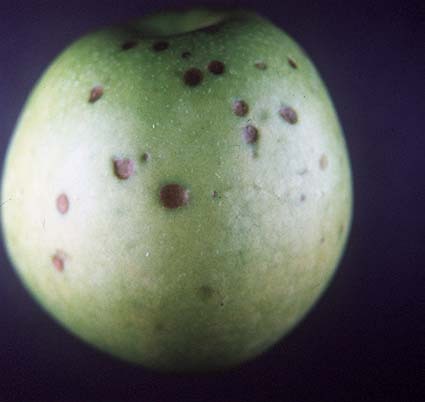 Immature fruit are more susceptible to bitter pit than fruit harvested at the proper harvest maturity. Older trees, which are less vigorous and produce larger crop loads, reduce their susceptibility to bitter pit except in the very sensitive cultivars. Granny Smith, Yellow Newtown, Jonathan, Golden Delicious (California), Gravenstein, Red Delicious (California), Baldwin, Boskoop, Bromley's Seedling, Cleopatra, Cox's Orange Pippin, Grimes Golden, Merton, Rhode Island Greening, Worcester, Stayman (Canada), Sturmer, White Winter Pearmaine, Prima Starking, Starkrimson, Marigold, Northern Spy, and York Imperial. Rome Beauty, Golden Delicious (Canada), Macintosh, Spartan, Haralson, Lobo, Winesap (California), Red Gravenstein, Stonetosh, Gala, and Fuji. Initiation of symptoms may begin four to six weeks after petal fall when affected tissues have a higher rate of respiration and ethylene production. This is a period of greater protein and pectin synthesis with greater migration of organic ions into the affected areas. Affected areas retain starch grains not seen in healthy tissue. A mineral imbalance in the apple flesh develops with low levels of calcium and relatively high concentrations of potassium and magnesium. Low levels of calcium impair the selective permeability of cell membranes leading to cell injury and necrosis. Other explanations for the cause of bitter pit include the dissolution of the middle lamellae by oxalic and succinic acid, and changes in proton secretion and potassium permeability. Cultural practices that reduce the incidence of bitter pit are annual bearing, moderate tree vigor, smaller fruit size, calcium sprays, summer pruning and harvesting mature fruit. Avoid nitrogen and magnesium summer sprays, fertilizer treatments that result in lowering the soil pH or induce excess vigor, and fluctuating soil moisture. Early thinning and over thinning can increase bitter pit. Do not over dormant prune, which would result in a light crop and large fruit. Summer sprays of calcium chloride(CaCl2), calcium nitrate [Ca(NO3)2] and/or a postharvest dip in a calcium solution are recommended. Both CaCl2 and Ca(NO3)2 summer sprays are effective at reducing the incidence of bitter but the response varies with the cultivar and both may cause russeting and leaf burn under certain conditions. In California, apply at least three sprays at one month intervals beginning in mid-June. Use 20 pounds of Ca(NO3)2 per acre in 400 gallons of water or 12 pounds of CaCl2 per acre in 400 gallons of water. Apply sprays under conditions of rapid drying to prevent russeting. Orchards with a history of severe bitter pit should receive four to six sprays or more at two week intervals. Fruit coverage is mandatory. Postharvest dips before storage may reduce bitter pit symptoms. Use 2-3% by weight CaCl2 in the drench water. Calcium dips can cause fruit injury, follow the label recommendations carefully. Preharvest sampling for bitter pit is possible. Two weeks before harvest select large fruit from upright limbs of light cropped, vigorous trees. Dip the fruit in a solution of 2,000 ppm ethephon in water (about 1½ teaspoons of ethephon to one gallon of water) to hasten the ripening process. Hold the fruit for two weeks at room temperature. If bitter pit develops, delay the harvest as long as possible. Cool the harvested fruit as soon as possible and delay the packing for at least four weeks. The delay will allow the bitter pit to fully develop. The affected fruit is then removed during the packing process. Integrated Pest Management For Apples and Pears. University of California, Division of Agriculture and Natural Resources, Publication 3340, 1991. ISBN 0-931876-94-X, Library of Congress Catalog Card No. 91-65337. Bitter Pit of Apples. University of California Cooperative Extension Publication, Division of Agricultural Sciences, Leaflet 2712, 1975.